Where to start this story? Hmmm… May be, 3rd June 1985. Ever since I was born I never had any inclination for fitness, sports or anything in those lines. Not my fault though… my entire family has never given any importance to physical fitness or sports. All my school days I opted for cultural events like oration, mimes and drama instead of sports. I was a kid who never ran 100 meters continuously throughout my school or college days. Unlike other chaps, I had not even played cricket beyond an extent. I always opted to sit in commentary or compering instead of playing the tournaments. I had always been a lazy flabby kid with nicknames of tomato, potato etc. Coming to college it still got worser as fag and pint became a part of life. Starting on a job in 2006, worst junk food habits joined my sedentary lifestyle. Leading a typical bachelor life, Friday and Saturday night drinking sessions added generous kilograms around the hip. Getting married in 2013 – the food habits got streamlined a bit, party nights were restricted and I quit smoking completely. Still I was a guy who always wanted someone else to get out of the sofa and switch on the fan. Very very reluctant to move. But one thing is, I had always been happy & positive and never ever felt bad for any of these – happily sitting, happily lying in bed till 9 or 10 AM and happily immobile. Then came the end of 2014. Not sure how it started but I got into a kind of weird addiction or phobia where I read the symptoms of some kidney related ailments on the internet and started imagining them on me. Then with utmost apprehension I would approach a specialist doctor and do all the diagnosis tests which would turn out to be 100% negative. But I would still google out the results and get overanxious and stressed that the diagnosis might have missed something and go meet the next doctor. I had met almost 8 kidney specialists, 1 cardiologist and a lot other doctors all alone during those couple of months. Most of them said everything was normal which I refused to believe because of my cyberchondria, with the 80-90 search result pages of google consuming my mind. At some point things started going out of control, and in over anxiety I was unsure what I was doing. When Vaidehi (http://vaidehivc.blogspot.com/2015/02/my-fight-against-dreadful-disease-cancer.html) and Paul Kalanithi(http://paulkalanithi.com/) were giving you the hopes for life, they were scaring me with the fear of cancer somewhere deep inside. And this google bugger passed on my search keywords to Facebook, which started flooding my timeline with offers on kidney checkup at hospitals in and around Chennai. Nightmare after nightmare was playing out, and the worst part was – I didn’t discuss this with anyone else in the family or friends thinking they will get afraid. Then somehow I calmed myself, discussed this with the family, and did one more round of checkup with them, found nothing but still scared and depressed. Ok, alright and we thought of going for some anti-anxiety medication to get things under control. 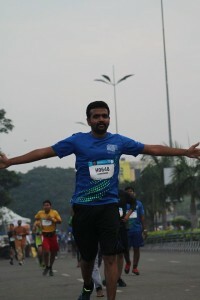 There I read a Tamil blog of my blogger friend Athisha(http://www.athishaonline.com/2014/12/blog-post.html) on his running the Chennai Marathon which inspired me, and thought I will try running for a few days and see if that helps bettering my situation, or else go for anti-anxiety medication. And now I feel that’s the best decision I have ever taken in my life. Initially like most other beginners I was not able to run even 100 meters, going out of breath with clearly audible heart beats. Somehow I got out in the morning for ‘running’ (as I called it.J) continuously for a month and was seeing some improvement and was able to go up to 400 meters without stopping. My wife, sister and the whole family were encouraging me to wake up and go run. That’s when I chanced to see the info on Dream Runners website and their practice sessions for DRHM. With great reluctance I registered for their OMR chapter’s training but didn’t go for the first few weeks thinking I might look in a bad shape running among seasoned runners. But I somehow made up my mind to join the training sessions and went on 23rd April 2014. The second best ever decision of my life. The scheduled training, running with a group, new social circle, cheering up and motivation from the veteran runners of DR, all made a huge difference and I directly registered for a half marathon. Streamlined training helped us in improving the running mileage slowly and strengthening workout sessions enhanced fitness and flexibility. The endorphins that were rising up after every session helped me slowly get out of my cyberchondria and internet addiction mode. I consciously thought and changed my food and hydration habits to some extent. Somehow surviving an over strain tendon injury, I continued practicing with OMR dreamers for DRHM’15. It was July 26th 2015. Even though I struggled after my 15th kilometer on the D day, all the practice and strengthening done with the group aided me in doing a sub 3 hour run in my very first event DRHM 15. That was the moment I was completely out of my affliction and back to normal. No more worries, as I was able to move or run or walk for 3 continuous hours and oh yessss “ I am healthy” !! And thereafter, the training sessions became part of my weekly routine. If in town, all the Thursdays, Saturdays and Sundays are spent with the group. Surviving one more foot injury because of the bad roads Chennai rains made, came back strong and finished a 2.32 HM on the TWCM’15. All because of the structured training/strengthening sessions from our coaches, and the motivation from the fellow runners in the group. Run Run Fun Fun with OMR dreamers.